Design House Stockholm's Barbara water carafe is a highly sculptural water carafe with a twist. Its stopper can be cleverly stored in the bottom to create a visually stunning sculptural design element. This carafe is so beautiful that you will always want to have it on your table! Good design is about purity of form, and Design House Stockholm's Barbara carafe epitomizes this maxim to illuminating effect. The Swedish designer behind the Barbara carafe, Nina Jobs, refined a standard water carafe into something truly beautiful. With the Barbara carafe , the lid is shaped as a amethyst-colored crystal glass ball. This ball can be used as the lid or placed in the circular cavity of the bottom of the carafe for a beautiful visual effect. The Barbara water carafe by Design House Stockholm as a capacity of 50 fl. oz. (1.5 l). The carafe is made from mouth blown crystal clear glass. 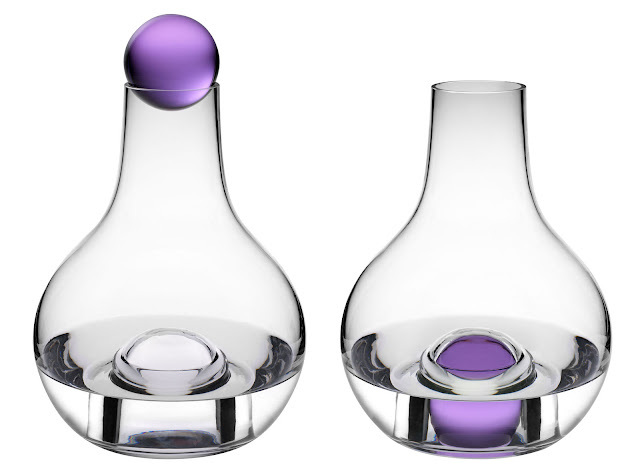 The stopper is made with amethyst-colored crystal glass. This carafe comes packaged in a black gift box; making it the perfect gift idea. A new Scandinavian design classic!